Huh. 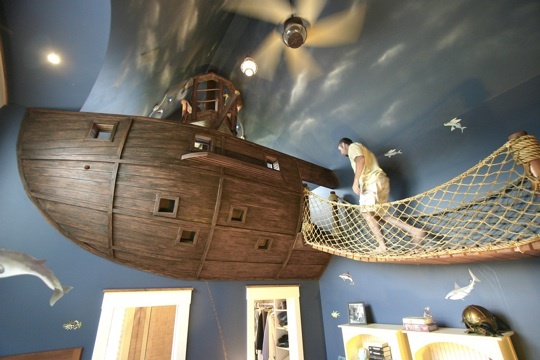 I guess the impending surgical doom is making me feel remarkably indecisive today because I cannot accurately gauge whether this kid’s outrageous, extravagant pirate bedroom is making me want to bow down and worship his generous, imaginative parents — OR INSERT MY BE-BUCKLED, BLACK-LEATHER, THIGH-HIGH SHIP-KICKERS DIRECTLY INTO THEIR OVERINDULGENT UGLY-AMERICAN BOOTIES. I shall let you decide. Given the money, time, and skill I would totally build something like that for Spawn. Build it for the kids? It’s wasted on them. I’d build it for myself.